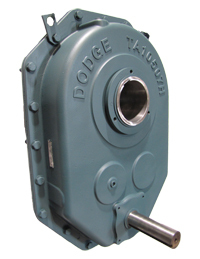 I would like to review the improvements and changes Dodge has made to their highly successful Torque arm shaft mount reducer. Taking a page from the Falk shaft mount, they have implemented a modular housing. This new housing means you will have to use the new style motor mount and torque arm with this unit. The engineers at Dodge were hard at work when they designed these units. They used wider gearing and increased the gear centers. What this means for you is more horsepower. They compare in ratings to the next larger size unit in the original TXT line. TXT-10 rates 60hp at 25-33 rpm but the new TA10507H rates 75 hp at 25-33 rpm.